Research can be a rewarding experience during the undergraduate career, but getting started can sometimes be a daunting task in itself. 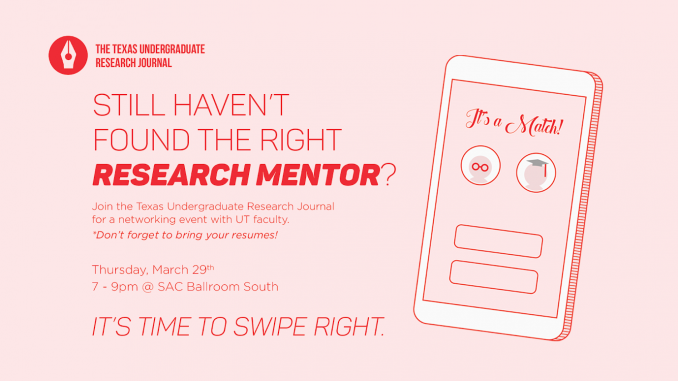 So, if you’re looking for a research project or lab to join, or are interested in finding a mentor, come out to the Texas Undergraduate Research Journal’s networking event. Faculty and grad students will be there to talk about how to get involved in research on campus. Join us March 29th, 2018 at the SAC Ballroom South from 7-9 pm. Check out the Facebook event for more information here.